The University Club, in the former Stacy House at the corner of Boren and Madison on First Hill. One of the remaining handful of the grand houses that once characterized the neighborhood. 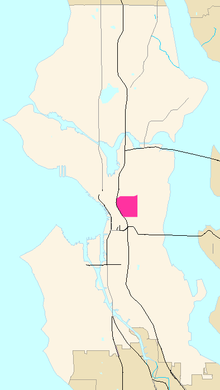 First Hill is a neighborhood in Seattle, Washington, named for the hill on which it is located. The hill, in turn, is so named for being the first hill one encounters traveling east from downtown Seattle toward Lake Washington. First Hill is bounded on the west by Interstate 5, beyond which is Downtown, on the north by E. Pike and E. Madison Streets, beyond which is Capitol Hill, and on the south by S. Main St., beyond which is the International District. The City of Seattle provides conflicting information about its eastern limit, beyond which are Cherry Hill and the Central District. Some describe it as being bounded by Broadway and Boren Avenues, while others describe it as being bounded by 12th Avenue. First Hill rose to popularity in the 1890s as a location close enough to downtown for convenience, but far enough out to offer a sense of retreat for the wealthier residents of Seattle. Among the elite to live on First Hill at that time were Indian fighter turned wealthy businessman Granville O. Haller, local judge Cornelius H. Hanford, successful meatpacker Charles Frye (whose private art collection is now open to the public at First Hill's Frye Art Museum), contractor Morgan Carkeek (for whom Carkeek Park is named), William Boeing, founder of the Boeing Company and Judge Hiram Bond. Noted photographer Imogen Cunningham and her husband Roi Partridge lived on First Hill in a boarding house in the 1910s until the residents of the house were evicted and the property converted into a hospital. More recently, local philanthropist and businesswoman Patsy Bullitt Collins resided in a First Hill condominium. The first official King County Courthouse was built on First Hill in 1889–1890; the steep climb to the courthouse from downtown legal offices caused such frequent and vociferous complaints that Seattle lawyers nicknamed the area "Profanity Hill". The courthouse, constructed on the corner of 7th Avenue and Alder Street, was quickly outgrown, which, along with the loud dissatisfaction of local attorneys, led the county to move the courthouse off First Hill in 1916. The hill is also known as "Pill Hill" because, in addition to being the current home of three major health care facilities (Harborview Medical Center, Swedish Medical Center/First Hill, and Virginia Mason Medical Center (four if Swedish Medical Center/Cherry Hill, located on 16th Avenue, is included in the neighborhood)), as well as the Puget Sound Blood Center, it was also once the location of the Maynard, Seattle General, and Doctors Hospitals (all of which merged into Swedish) as well as Cabrini Hospital. First Hill has been home to Seattle University, a private Jesuit university, since 1891. Also located on the hill are Northwest School and Seattle Academy of Arts and Sciences—two highly regarded private schools—and the Catholic O'Dea High School, Frye Art Museum, as well as several churches that have become city landmarks: Trinity Parish Church, St. James Cathedral, and Seattle First Baptist Church. First Hill's major thoroughfares, assuming its greatest possible extent (see above), include Madison, James, Cherry, and Jefferson Streets and Yesler Way (east- and west-bound) and 9th, Boren, and Broadway (north- and south-bound). A Link Light Rail station was originally planned for First Hill, but was cancelled due to geotechnical risks prior to the construction of University Link. Instead, the First Hill Streetcar was built on Broadway and Jackson Street to connect First Hill with the International District / Chinatown and Capitol Hill stations after it opened in 2016. ^ "First Hill Neighborhood Plan Area" (PDF). City of Seattle. 1999. Archived from the original (PDF) on January 1, 2017. Retrieved June 16, 2017. ^ "First Hill [map]". Seattle City Clerk's Geographic Indexing Atlas. City of Seattle. Retrieved June 16, 2017. ^ Ahmad, Fazel (July 24, 2005). "First Hill Station Recommendation" (PDF) (Letter). Letter to Joni Earl. Sound Transit. Retrieved March 25, 2015. ^ "First Hill Streetcar". Seattle Streetcar. Retrieved 25 March 2015. 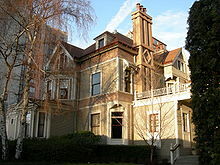 Wikimedia Commons has media related to First Hill, Seattle, Washington.